Kansas Spring Snow Goose Hunts begin Feb. 1, we have these dates available right now they are Feb. 3-6, 19. Call if the dates you want are not listed and we will see if we can slip you in. Call Jason or Judi at 307-267-2559. 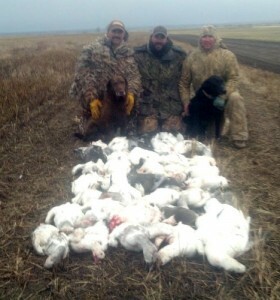 Spring Snow Goose Hunts in Kansas are field hunts over a base spread of 2000 decoys, 6 vortex machines, 2 sound systems, and over 200 fully flocked full body snow goose decoys. 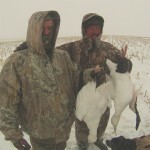 If you have never hunted spring snows then make this year your year to do it. Operating only 2hrs 45 minutes from Kansas City or 5hrs from Denver, Colorado. We arrange lodging for you at local hotel. Spring Snows, Blues, and Ross Geese all over decoys! Hunting Snow Geese! 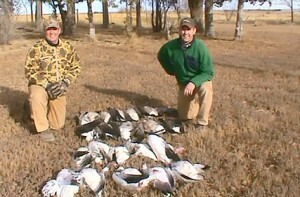 63 Bird Day in Kansas, South Dakota Hunts starting! 2/18/14 We are set up in Kansas now and killing Snow Geese over decoys regularly, the temps are in the 70′s today and the ice on the lakes is vanishing fast! NEW snow geese arriving daily, hunting will only get better from here on out, we are seeing between 50,000 and 100,000 Snow Geese each day as it fluctuates with new birds arriving and other birds migrating north. These are good numbers but not huge numbers like at Mound City, HOWEVER the fact is we are the only guys hunting this area and I have yet to even see another spread of decoys in the area…this light pressure translates to geese that are much more willing to decoy down to great shotgun range…I’m talking 10yards on some groups. We had a single hunter that had a volley of shots over the fullbody spread as over 1000 snow geese came barreling down and started landing in the decoys, he shot 4 birds with three shots and all four birds fell with 15yards of our layout blinds. For those interested in our spreads we typically hunt over 1000-1500sillosock, 3-6vortex machines, 120 Fully Flocked Snow Goose Fullbodies, and 50+Flappers. 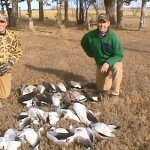 Kansas Waterfowl Count Increases, Hunting Great! Refuge counts in the area we hunt are as fallows, Canada Geese 40,000+, Snow Geese 225,000, Specklebelly Geese 8,000+birds. Our Kansas weather forecast shows mid 50′s for several days and the 10day forecast is warm. 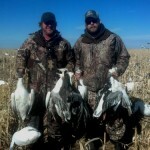 We have hunts available for February 1-5, 7-10, then the electric call season starts Feb 11 for Spring Snow Geese. Get with us we can answer your questions and show you a fabulous late winter hunt for waterfowl, call Jason at 307-267-2559. We also offer hunts in Wyoming, Nebraska, and South Dakota, call for details. LIGHT GEESE Season: Oct. 26-Nov. 3, 2013 and Nov. 6, 2013-Feb. 9, 2014 Area open: Statewide Daily bag limit: 50 Possession limit: No limit NOTE – By special conservation order, light geese may also be taken from Feb. 10 – April 30, 2014. During this period, there will be no bag or possession limit on light geese. In addition, participants will be allowed to use unplugged shotguns and electronic calls and take light geese from one-half hour before sunrise to one-half hour after sunset during the period of the conservation order. Keep yourself up to date, with what is going on with Upland and Waterfowl Game Bird Hunting. 2016 Combo HUNTS 3 species of Grouse & Huns!